The state and city released their report today on the redevelopment of the land which will be freed up by the removal of Route 195. The report is also available on the RIDOT website. The 169 page report reviews the land parcel by parcel. I have not had a chance to go through it so I will not be doing any commentary at this point. As I find time to delve through the report, I’m sure I’ll have more to say about it. Feel free to post your thoughts here as you take the opportunity to read through it. Also, RIDOT now has a webpage on the proposed streets with plans for download. This is the fourth of a series of posts we will be doing about the 195 Street Grid. To view all the posts and more information, please visit our 195 Relocation Project page. The I-195 Relocation Surplus Land Redevelopment and Marketing Analysis is a comprehensive study. The study appears to reflect compromises to appease all interested parties with little that is visionary. Among positive new recommendations is removing minimum lot area for dwelling-units. They proposed numerous changes to parking rules, many of which have been tested elsewhere and would be an improvement for Providence. There were weaknesses in bulk and mass proposals. One proposed a four-story maximum street wall with a 15′ building setback. Like most American cities Providence has no architectural legacy for setbacks. One exception is the 1920s Fleet Building, which was designed to copy the “style” of its day from New York. Setbacks are expensive for developers. They require more structure with an additional row of columns and beams to support the upper faÃƒÂ§ade. FaÃƒÂ§ade and roof details are more complex and costly. Class “A” office space and some laboratory programs require column-free space. Setbacks produce substandard space on lower floors due to column obstructions. In residential buildings lower floors are either too deep or upper floors too shallow to create quality apartment layouts. Regarding building heights the study suggested adopting the Sasaki zoning plan. The tallest structures proposed along the Route 95 corridor, will be the furthest from the proposed streetcar line. This would likely result in continued encouragement and reliance on automotive transportation for the highest density district. No offense, but given some of the architectural ingenuity I’ve read about with regards to cantilevering new buildings over pre-existing buildings (for an extreme example, One King West in Toronto, among many others) or rearranging a building’s support columns to accommodate pre-existing underground elements (like the traffic and subway tunnels of the Big Dig), I think an inventive architect should be able to create necessary column-free space to suit a client’s need. No fears about that. About setbacks. They developed in New York, this is true, but they’re more than just an architectural style. If they were simply an aesthetic element, that might be one thing, but they developed out of necessity. NYC mandated them when the public at the time complained about ever-more-immense buildings blocking out the light at street-level. Still a valid concern today, I think. Nice light ‘n’ airy feel on the sidewalks, desirable or no? Secondly, setbacks help give taller buildings visual continuity with the existing streetwall. Again, a valid concern today. For an example of this practice still in use today, take the new Trump Tower in Chicago, an extremely tall building. To give the appearance of continuity with its stubbier neighbors, it was designed with 3 setbacks to match the heights of the Wrigley Bldg., the Marina Towers, and 330 N. Wabash. Is this visual continuity merely an illusion, a little architectural sleight-of-hand? Don’t underestimate the psychological effect this simple strategy can have. Even our own Fleet Bldg. was specifically designed with trim at the 4th-story level that would match the cornice heights of the buildings around it at the time it was built. Personally, I think there’s enough bias against tall buildings in Providence that I welcome anything architects can do to incorporate their tall buildings with their surrounding neighborhoods. I agree with Sam on setbacks – they’re a necessary evil, especially in a New England city where sunlight is necessary to melt snow and ice before, say, June. I am a little disappointed at the apparent confusion over how to handle mass transit expansion, though. Cantilevers that are 15′ depth cost more because they require additional steel. Creating column-free space using transfer beams is also expensive. Alternately, a maximum cantilever depth of 7′ to accommodate a setback would be virtually free. In New York minimum street-walls heights before required setbacks typically are 65′; 85′; 100′; or 150′ not 4 stories (or 45′). New York’s setbacks, where required and that’s not everywhere, add greatly to construction costs. Providence’s constructions costs are just about parallel to Boston. Yet in the Providence market office rates and housing prices are well below Boston. If anything to be built in the new district, regulations shouldn’t be imposed that will add significantly to costs or obstacles. Focusing on these details misses the more important topic that the tallest structures with highest density are proposed along the Route 95 corridor, encouraging continued automotive reliance. I’m all for the planning process with this unique opportunity to build in a city with a blank canvass so to speak, but I have often thought that the city’s height restrictions in general are too conservative. I mean, look how often developers have to ask for variances. Set the heights higher to start with therefore promoting more density and removing a layer of the well-known-to-be-cumbersome approval and permitting process that is clearly seen as an obstacle to area development. Peter you’re right about the I-95 growth corridor and the proposed streetcar line, but surely we all agree that the streetcar route (as proposed), while a nice step forward in the right direction, can be considered nothing but a starter line? It’s certainly not a final vision for transportation in Providence. I mean, not to knock it, but as far as the citizens of Providence would be concerned, that initial streetcar line would provide almost no value on an everyday basis. Nor (even conceptually) is it intended to serve them. Right now, the idea is essentially a Brown/RIH people mover, nothing more. Without doubt, for the streetcar idea to be of any practical use to the people who live in the city, future expansions of the streetcar system would be necessary in all directions for the system to branch out into PVD’s (and ultimately even as far as Pawtucket’s, NP’s, and CF’s) residential neighborhoods. I mean, I hate to say it, but honestly, if we hadn’t spent the better part of the last 3 decades pouring untold trillions of dollars into wasted military efforts to police the world outside our borders, there would be lots of money in our budget for cushy home improvement projects like this. After the century we’ve had, American cities should boast the best multimodal infrastructure in the world. Should. Since when did relaxing height restrictions equal greater density, or even good urbanism? Atlanta is full of towering glassy buildings, but it’s probably the worst example of dense urban development on the planet. Meanwhile, Portland enforces a myriad of different height restrictions, and is generally viewed as a progressive, sustainable model for dense urban development. To say that relaxing construction regulations automatically generates growth and urban density is to say “lets give away the store for a little good press!” Of course by then, it’s too late. Sam, I agree that the proposed streetcar route would only be a beginning and that it would work more like a people mover to start. That alone would greatly reduce car trips if only Brown/RIH, not to mention bus or rail commuters that would have no practical way to quickly get to Jewelry District without it. Usually when initial transit infrastructure project phases are planned the first route(s) are along the most important corridors. My point is that if a streetcar line and new neighborhood development occurs in the next four or five years, officials should plan for neighborhood density to be more matched to transit infrastructure. Corey, No doubt Atlanta is one of the worst examples 20th century urbanism. Houston could be added to that list. With almost half of downtown’s surface area covered by parking lots, the reality is that from street level or an aerial view Providence looks more like Houston, minus the glut of glass towers. Please explain your concept of “good urbanism” How do you propose to incentivize the development community to rebuild the city? Call me naive, but personally, I would take some of the parcels not targeted for institutional use, subdivide them, and then sell the subdivided lots individually; much more in line with what would have been done in the 18th or 19th centuries. I feel like modern day urban planning is entirely too preoccupied with finding buyers to occupy an entire city block at once (see the Empire at Broadway for results), and then regulating the exact form and use of each block as an individual project. Dividing the parcels into smaller lots, say into quarters of a block rather than a full one, and selling those off individually generates a lot more opportunity for vital downtown property to be developed more affordably. It cuts down on bureaucracy by allowing development to be regulated more broadly as a district, instead of placing each developer under the microscope, and it requires less tax subsidy and sleazy back room negotiation to get the parcels developed. It attracts more young, growing businesses looking for quality affordable space than frivolously trying to lure big corporations to move, which rarely happens in any city, let alone Providence. It also allows a lot of building form regulations to be relaxed without risking so much insensitive development. *By allowing room for numerous property owners to have building facades on the same block, you’re almost guaranteed not to have a block-long dead space in any part of the district, because a variety of different uses and architecture occupy each street front. *By encouraging buildings with smaller footprints, building heights and proportions tend to be harder to abuse, decreasing the need to spend the time and money on the exhaustive specific zoning regarding height, mass, and proportion which tends to scare away developers. If anything should be exhaustively regulated, it’s materials and energy efficiency. *A more constant street life at all times of day, as well as greater walkability, and demand for mass transit expansion. Call me naive, but personally, I would take some of the parcels not targeted for institutional use, subdivide them, and then sell the subdivided lots individually; much more in line with what would have been done in the 18th or 19th centuries. Duany’s last charrette suggested this, though it was proposed for the area near the (new) Public Safety Complex. If I remember correctly, his reasoning was that it gave smaller developers/contractors the ability to get into the game. There’s not too many TPG’s or Carpionato’s out there (happily maybe), but there are lots of smaller entrepreneurs that can put together funding for a smaller scale development. Peter, as I understand it, one of the very reasons the city would be so eager to create a Brown/RIH route is that it would encourage dense development in the JD. Now, is that the best plan for creating a transit system? I don’t know. Personally, I’m of the mind that you’re probably better off giving people mass transit options where they are, rather than creating mass transit where you want them to be. That means serving the neighborhoods, to me, the idea being to match transit infrastructure with neighborhood density, as you say. Of course you’re familiar with the phrase “streetcar suburbs,” which is what most of PVD’s residential neighborhoods were when they first developed. And when the neighborhoods are served that way once more, PVD will once again be a healthy urban environment. Of course, that’s a dream that’ll probably be a long time coming true, but what’re a couple of decades in the grand scheme of things? At the same time, I realize that a Brown/KP/JD/RIH people-mover will get enough usage from Brown, KP, and RIH to reduce auto traffic downtown significantly, and if the route *happens* to pass through the JD as well, I know city planners aren’t going to complain. Big dreams of those Atlanta- and Houston-like glassy towers, and all that. Jef – you pretty much said everything I was thinking, in about 1/10th the amount of words. I think it’s a greatly underestimated simple development tool, which if used properly will ensure that the 195 land will not end up like capitol center. Over all, there are some great things in this plan, but I’m disappointed that the use of temporary parking lots was even brought up, let alone suggested in it. Small lots are a great idea. Traditional large developers or small mom and pop developers could all participate. Numerous 2,000 SF to 5,000 SF lots using downtown’s traditional four to six story building heights has the potential to provide much higher density than anything proposed in the 195 surplus land study. Although, it’s likely the building code could pose some problems. For this to work, the catch is that parking can no longer be a part of the equation. As soon as cars are added to the mix, giant parcels are required to park cars. Also, waiting for a bus on a half hour schedule won’t work either, if you’re in Capital Center or at an office on South Main Street and have a meeting in the Jewelry District, when it’s 93 degrees and humid or 32 degrees with freezing rain with slush on the ground, unless there is frequent downtown transit that runs on 5-9 minutes schedules most of the day. No matter whether the transit runs north-south, east-west, in a circle, or all those options combined. Good urban design can be achieved with either five story buildings or towers, if designed well. It’s been suggested that I’m either advocating for conventional development schemes or simply shifting density from 95 to the river. I’m advocating for a traditional downtown Providence density that existed before the 1950s, which translates roughly to 5 to 12 FAR (Floor Area Ratio),that relies heavily on transit, and that is development that could realistically and affordably be built. Since the effective owners/sellers/regulators of the 195 parcels are RIDOT, RIEDC, and the city Planning Dept., the challenge becomes how to convince them that small lots, low building heights, no required parking, and frequent transit service would be a better scenario for the 195 parcels. It’s not even that building heights should necessarily be “low”, it just doesn’t seem necessary for them to be 30 stories tall and an entire block in circumference. The plan calls for certain parcels to be reserved for institutional development, around which private development will cluster. This makes parcels with relatively small lots a perfect fit directly adjacent to institutional zones. It allows that private industry to cluster organically, without having to wait for the proxy of big name real estate development to get moving. Parking would be an issue with small lots, and I haven’t quite figured out how to resolve that problem. Public parking structures would certainly help, as well as the idea already in the plan of allowing off-site parking to replace the on-site requirement currently in place. The reality is, as Peter said, that this district won’t reach its full potential without improved mass transit. Luckily for us, The Don is leaving office in 2010, so we have a shot at winning some finance on the state level when the administration changes. As far as pitching small parcels, I’d be thrilled to put a coalition of sorts together, not that I’m a professional. After all, we have a couple of years to work on the idea. The key as Cory points out is to allow development to “cluster organically.” In a small way proposing “small-parcel blocks” between large conventional blocks would recall some of the city’s earlier development patterns. Even with a comprehensive transit option, parking cars for the foreseeable future will be necessary. A remote garage decking over part of the 95 canyon is attractive, but to build one structured parking space costs between $12,000 and $20,000 each. Who would pay for it? Perhaps there could be an urban design solution on one of the “small-parcel blocks” themselves or something else. No one will be building much for the next several years. However, it will be irresistible for all players whether large or small or public or private to land bank. So in fact there isn’t much time to develop and lobby for another option. Cory – How would you propose starting the coalition group? Corey – Sorry for the misspelling. The primary focus of the city/DOT plan seems to be commercial development – job growth, wage growth, tax revenue – using the schools as catalysts. At the same time, our mission is to incorporate sustainable land use policies and historical development patterns, in lieu of strictly conventional development methods, as ways to foster that growth, also using the schools as catalysts. So, the theoretical coalition can be broken down into 3 main groups to make it effective: educational institutions, non profits, and private developers. Since both our plan and the city’s plan identify institutional parcels as the catalysts for private development, having the schools on board with us seems to be the most important piece. It will also probably be the most difficult to accomplish, but not impossible. If we can pitch this idea to the schools, especially Brown, then they can use their influence with the city and DOT, rather than us trying to “fight city hall” on our own. After all, we’re not the ones with the money. Non profit planning entities will also be key here, since they’re very good at providing theoretical models, case studies, and historical research. I think getting PPS involved might be a good idea, and someone like Urban Smart Growth would be helpful too. Jef mentioned Duany and his army of New Urbanists earlier, and their suggestion to subdivide the lots on the West Side of 95 a few years ago. Perhaps they can be involved as well, or at least their previous suggestion can be advocated. After all that, though, we still have no case if we don’t have buyers, which is where developers come in. If our premise is that marketing land to small and mid sized real estate companies will lead to faster, better development, then it stands to reason that we should have some of these companies present. Aside from Cornish, I don’t have any specific suggestions on this yet, since I don’t really know the market, but the non profits should be able to connect us with that information too. I’m getting way ahead of myself here though. Corey – These are all good ideas. Maybe the further discussion on forming a coalition group would be better held off-line? Peter – I agree. How do we get in touch? leave an email address with Jef, I’ll do the same. 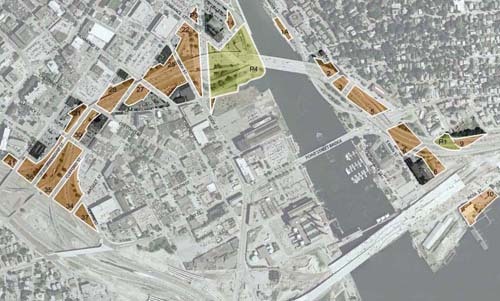 It would be a complete waste to reciaplte Boston’s Big Dig park corridor for the 195 land. It would be a manicured wasteland. There’s already too much park downtown. Much of the current river walk is empty most of the time. The exception is during a Waterfire or other special events. The same is so for the Roger Williams Memorial and somewhat with India Point. What’s needed is higher density with people living and working directly adjacent to parks to use and appreciate. This notion that new parks are needed everywhere in cities and that there’s not enough green in urban areas is a suburban concept. A version of cityWALK would be a better alternative, as the majority of the land would be reserved for buildings.